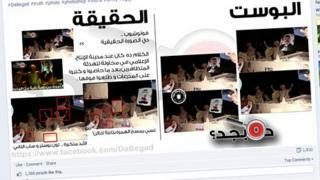 So many faked images are circulating in Egypt that Facebook sites have been set up with the goal of separating fact from fiction, writes BBC Monitoring's Dina Aboughazala. While tensions between opponents and supporters of ousted President Mohammed Morsi flared into violence in Cairo this weekend, social media has long been a battlefield. Rumours, fabricated images and fake accounts have emerged on Facebook and Twitter, as each side uses the internet to tarnish their rivals' reputations. This activity has intensified since the army removed Mr Morsi from power on 3 July. The deposed president's supporters, who have tried to depict events as a conspiracy led by the Coptic Church and secularists, used one image of a group carrying a cross to claim Christians had led protests against the Islamist president. The photograph dated from 2012, it later emerged. Meanwhile, it has been claimed that photographs of dead children were presented by pro-Morsi supporters as evidence of killings by the Egyptian Army, with the military saying the images had originated from the conflict in Syria. The sheer volume of disinformation has led to the creation of verification pages on Facebook, such as Da Begad? - or Is This Real? - which tries to verify posts, images and videos, regardless of their origin. Despite the confusion, social media remains an important source of information in Egypt, with authorities and ordinary citizens alike using it as their main channel of communication. Facebook is said to have 13 million users in the country. Meanwhile, BBC Monitoring's Kiev office reports that Facebook users are complaining that flowers were digitally added to a photograph showing off the Ukrainian capital's preparations for a religious event. Authorities there allocated 30m hryvnyas (£2.4m) to prepare for celebrations around the 1,025th anniversary of the Baptism of Rus - the conversion of the region's pagans to Christianity. But when Zelenbud, the state company that buys and plants flowers, posted the picture of its container displays on Facebook, users queried why the pots cast no shadow. One user commented: "Zelenbud proudly reports where it spends 30m hryvnyas... on ham-fisted Photoshop users." Another complained that "the story with chestnuts is repeating," referring to a recent controversy which brought tree-planting into the headlines. It seems officials had announced that expensive Brioti chestnuts had been imported from Italy, only for them to be revealed as a cheaper variety when they blossomed.